Preheat oven to 400ºF. In a large skillet over medium heat, cook pancetta until browned and crisp, about 5 minutes. Transfer to paper towels to drain and cool. 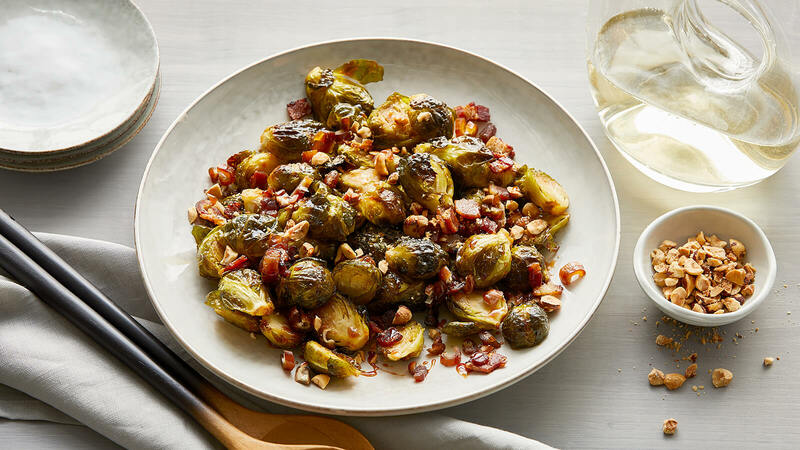 Toss Brussels sprouts in oil on a large sheet pan. Turn sprouts cut side down and bake until browned and tender when pierced with a knife, about 30 minutes. Remove sheet pan from oven. Scatter chopped dates over sprouts and drizzle date syrup over, tossing to coat. Return to oven and bake until syrup is bubbling, 5-8 minutes. Remove from oven, sprinkle with vinegar and mix well. Season to taste with salt and pepper. Transfer to a serving dish. Sprinkle with pancetta and hazelnuts and serve immediately.